Some things seem inevitable. Not only in having an insurmountable advantage, but also that over and above everything somehow will go for you. We got both this time, and it felt like something we'd seen plenty before. 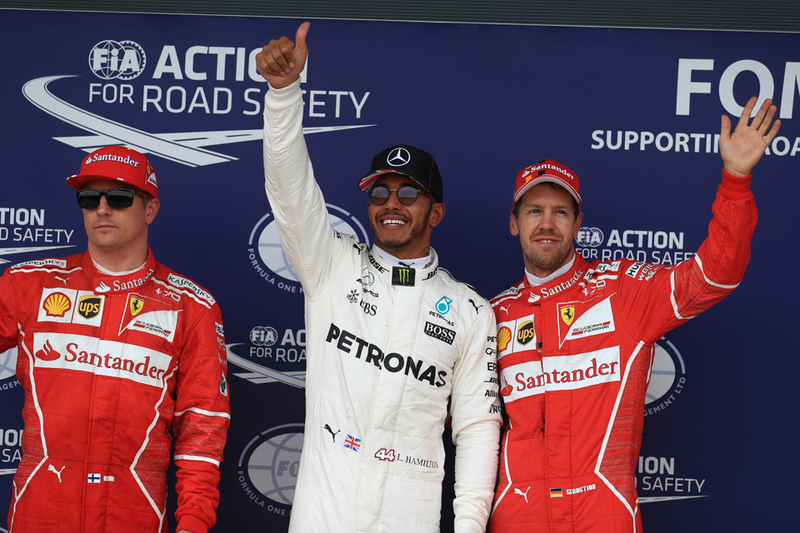 Lewis Hamilton took pole position for the British Grand Prix, as he always was going to. The Silverstone circuit could be designed for the Mercedes, and it showed. But even of the Merc pair Lewis seems to have inherited Nigel Mansell's traits for his home round. Ensuring his adoring public is not disappointed by being on another level of all others. That for the rest it will be an exercise in futility for first place. And Lewis got some luck he hardly needed, with not only the similarly-equipped Valtteri Bottas but also an expected close (a relative term) challenger Daniel Ricciardo getting five-place grid drops in advance for changing their gearbox, thus making the pole fight for them properly futile. It looked in advance too that the British summer weather might be Lewis's only impediment, as rain was supposed to arrive for the end of quali. As it was it arrived for the start, as drizzled gathered minutes before the get-go. Yet it proved the most minor of irritants, particularly as it didn't hang around long. Later Lewis's pole looked under threat from the even less likely source of being investigated for impeding Romain Grosjean. But he got away with that too. Ricciardo indeed was ruled out definitively in Q1. He actually was top at that point as the Red Bulls made the smart move of starting the session on the intermediate tyre. But then he was spotted parked, with an apparent turbo failure. For Q2 though the track was good for slicks again, and things settled down into the expected order, with Lewis ahead. 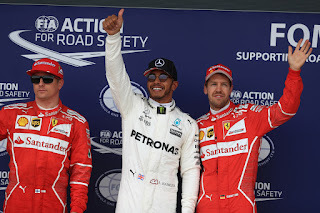 Sebastian Vettel got within two tenths of Lewis's table-topping time after their first Q3 goes; optimists reckoned there might be a fight on. Not a bit of it. On the final runs Lewis whizzed around the rapid track seemingly painted to the road. He stopped the watch a stunning half second plus under what anyone else managed, as well as three-quarters of a second under his stable mate. "I always try and save the best 'til last," Lewis beamed. Another thing he shares with Nigel being ever the showman. "I feel great about it, especially with a great crowd like this all the way round the track. "It's definitely the best position to start from. The long runs were looking great so I need to make sure I do it for these guys [the crowd]. "The car just felt like it progressed really well. I think actually the rain was a blessing at the beginning because we didn't have to use the slick tyres at the beginning. Saved them to have two runs in Q2 and then two runs in Q3. So it was just a nice, steady build-up." 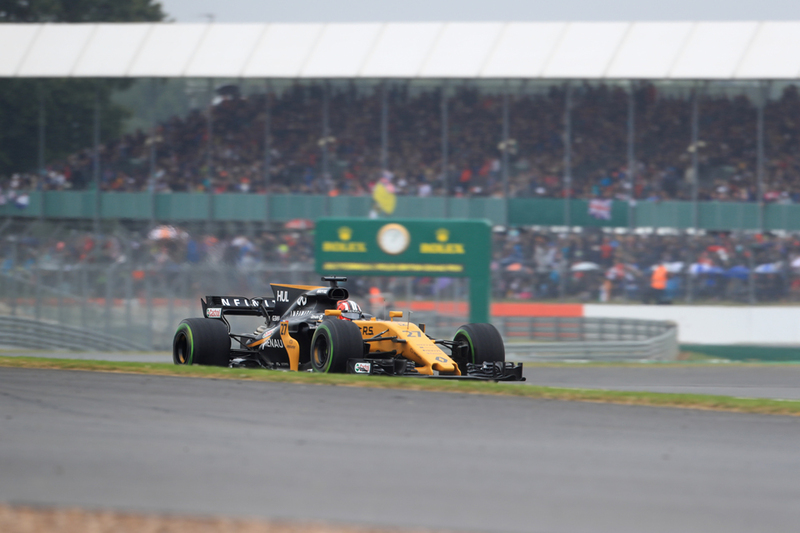 Appropriately too he clocked his final laps at upwards of a 150mph average, the first to do so at Silverstone since… Nigel Mansell (in 1990). "Having all that focus and attention and support pointing into one spot, into me. I've been really privileged over the past ten years to come here and receive that love." The historical echoes were all around. Lewis became the first to get five British Grand Prix poles since another who always went well at his home round, Jim Clark. Lewis could match his British Grand Prix win record tomorrow too. He also is now one short of Michael Schumacher's all-time pole record. The Ferraris were next up on the grid, recovering today after spending Friday looking like they might struggle to beat the Red Bulls let alone the Mercs. Vettel noted it had "come alive" between times; reports suggested the changes were substantial. Vettel meanwhile bemoaned (including in colourful terms on his radio) that his final out lap had been compromised in traffic which in turn compromised his tyre preparation for his last effort. With echoes of his team mate last week Bottas faltered with the knowledge that he'd add five to whichever grid slot he achieved. And fourth best was his lot, which coverts to ninth tomorrow. As with Lewis then too he'll be on a contra-strategy in the race, as he'll start on the tougher soft compound tyre. It should be a more fruitful approach than for Lewis in Austria, as the soft looks a conspicuously superior race tyre. 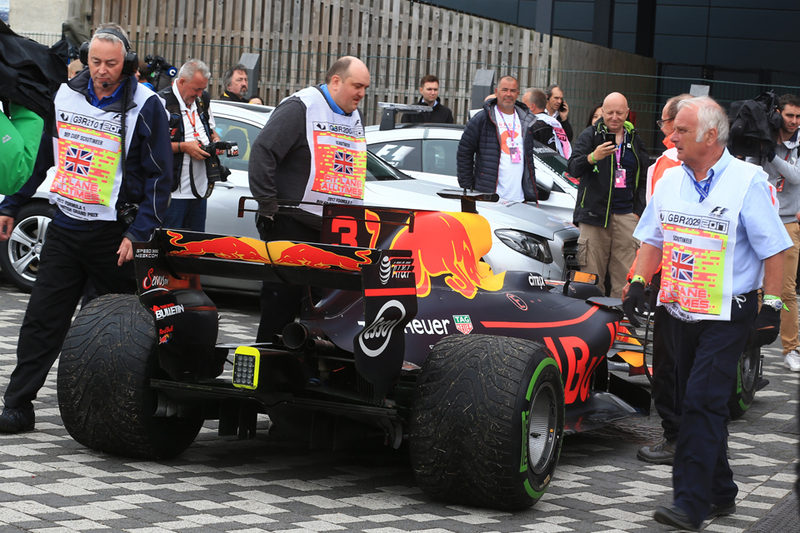 Max Verstappen was next up, perhaps relieved to not get the Red Bull bad luck for once. He noted afterwards however that his car lacks "everywhere". This all was not before Fernando Alonso in that way of his directed some attention towards himself. He, alone, decided late in Q1 and while at the bottom of the times to switch to slicks. 'Late' is the word, as he crossed the line to start his lap with something like nanoseconds to spare before the chequered flew. Then he topped the times. Even the Silverstone tribunes, not always a place historically to find Nando love, roared its approval. But then again he knew he had a 30 place grid drop for tomorrow anyway, for changing engine parts, which likely explained much of his abandon. He was another undertaking an exercise in futility. His nominal eventual place was 13th, after getting rather evil traffic in Q2. 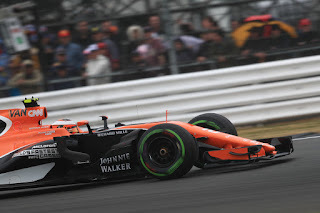 The other McLaren though of Stoffel Vandoorne for the first time qualified ahead, indeed got P9 (which converts to P8). 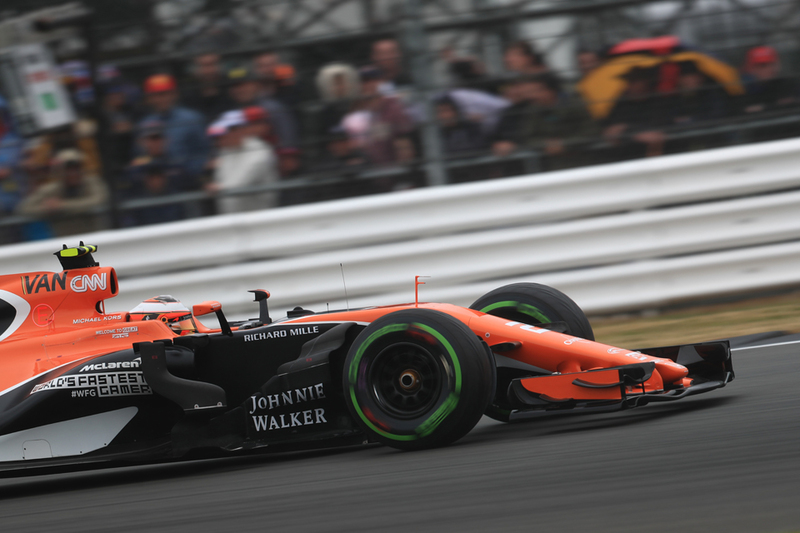 Silverstone is an unusual track; Alonso's car wouldn't have been set-up for quali. But… the Belgian has looked quick all weekend and some spoke of him making a breakthrough last weekend in Austria. 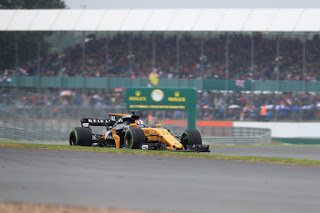 Nico Hulkenberg always goes well on such greasy wet-to-dry days and did so again, frequently being near the top of the timing screens. Then again he looked good in dry practice too, a consequence of his Renault's new floor. He got sixth place which transfers to fifth on the grid, the first in the 'Grand Prix 2' category that Romain Grosjean spoke of in Austria. Sadly though it's not thought the Renault can keep such pace up in race conditions. Then came the ubiquitous Force Indias, Sergio Perez again just ahead, with Vandoorne and Grosjean completing the top ten. 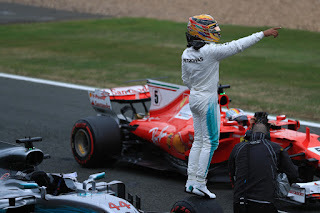 Some noted that with two Ferraris behind Lewis that the red pair may be able to make a pincer movement on the Englishman tomorrow - one overcutting; one undercutting. They'll have to keep up with him though, which doesn't look likely. Lewis's race runs were about as clear of the rest as his qualifying pace. "We try, we try, we try and see what happens. I obviously have nothing to lose so we try to make a good race for the team," noted Kimi after quali. Letting on more than he intended. Vettel let on too. When asked whether he had any chance of matching Hamilton's time today the German said: "No. I think the time he put in at the end was very strong. "I think he owned the pole position today." 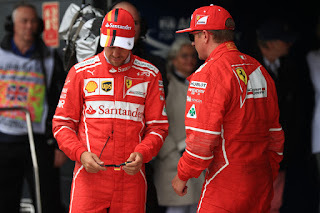 Both Ferrari drivers reckoned the car would be more potent in the race. Equally both looked a little shell-shocked. There is many a slip betwixt cup and lip of course. But given everything outlined it is near impossible to envisage how anyone other than Lewis Hamilton win will tomorrow's British Grand Prix.